Hoop Dreams is a 1994 American documentary film directed by Steve James and written by James and Frederick Marx, with Kartemquin Films. It follows the story of two African-American high school students in Chicago and their dream of becoming professional basketball players. Originally intended to be a 30-minute short film produced for the Public Broadcasting Service, it eventually led to five years of filming and 250 hours of footage. It premiered at the 1994 Sundance Film Festival where it won the Audience Award for Best Documentary. Hoop Dreams is the most recent documentary film to be specifically nominated for the Academy Award for Best Film Editing. Despite its length (171 minutes) and unlikely commercial genre, it received high critical and popular acclaim, and grossed over $11 million worldwide. The film follows William Gates and Arthur Agee, two African-American teenagers who are recruited by a scout from St. Joseph High School in Westchester, Illinois, a predominantly white high school with an outstanding basketball program, whose alumni include NBA great Isiah Thomas. Agee and Gates are both from poor African-American neighborhoods in Chicago, Illinois. Gates lived in Cabrini–Green while Agee and his family resided in West Garfield Park. Taking 90-minute commutes to school, enduring long and difficult workouts and practices, and having to acclimate to a foreign social environment, Gates and Agee struggle to improve their athletic skills in a job market with heavy competition. Along the way, their families celebrate their successes and support each other during times of economic hardship caused from the school change. The film raises a number of issues concerning race, social class, economic division, education, and values in the contemporary United States. Seed money for Hoop Dreams came from several sources, including the National Endowment for the Arts, PBS, and PBS member station KTCA in Minnesota. Kartemquin Films of Chicago is credited as a production organization along with KTCA. The film was given as an example to defend the level of U.S. government funding of PBS, which was reduced in the following years. The film was originally intended by filmmakers Peter Gilbert, Steve James, and Frederick Marx to be a 30-minute short, shot in three weeks, to be aired on PBS, focusing on one playground court and its young players. The filmmakers followed the children back to their homes, and after nearly eight years, and with over 250 hours of raw footage, a 30-minute PBS special turned into a three-hour feature film on the lives of Gates and Agee, while grossing $7.8 million. At one point, the electricity was turned off in the Agee home; the filmmakers continued filming and (off-camera) provided money for the lights to be turned back on. Without any money, the crew shot five days in the summer going into freshman year, seven days of freshmen year and 10 days of sophomore year. Once demo reels were released, the filmmakers began to hear back positive results and gain funds. CPB funded $70,000 and KTCA gave another $60,000, MacArthur funded $250,000. With their large funds, the crew shot 40 days junior year, and shot 100 days between the summer of junior year and the end of the film. The film was universally acclaimed by critics. Gene Siskel and Roger Ebert gave the film "Two Thumbs Up" on their show and both Siskel and Ebert named Hoop Dreams the best film of 1994. Ebert in his initial television review proclaimed "This is one of the best films about American life that I have ever seen", and later called it the best film of the decade  and "one of the great moviegoing experiences of my lifetime." In 2004, The New York Times placed the film on its Best 1000 Movies Ever list. The film currently has a 98% rating from Rotten Tomatoes, with only one negative review (against 47 positive). The film was ranked #1 on the International Documentary Association's Top 25 Documentaries list, based on polling of members in 2007. When the film, along with the equally acclaimed Crumb, was not nominated in the Best Documentary category of the Academy Awards, public outcry led to a revised nomination process in the category, led by Barbara Kopple. According to an angry Ebert, reliable sources said members of the Academy's documentary nomination committee had a system in which one would wave a flashlight on screen when they gave up on the film. When a majority of the lights flashed, the film was turned off. Hoop Dreams didn’t even make it to 20 minutes. The Academy's Executive Director, Bruce Davis, took the unprecedented step of asking accounting firm Price Waterhouse to turn over the complete results of the voting, in which members of the committee had rated each of the 63 eligible documentaries on a scale of zero to ten. "What I found," said Davis, "is that a small group of members gave zeros to every single film except the five they wanted to see nominated. And they gave tens to those five, which completely skewed the voting. There was one film that received more scores of ten than any other, but it wasn't nominated. It also got zeros from those few voters, and that was enough to push it to sixth place." In 2007, the International Documentary Association named Hoop Dreams as its selection for the all-time greatest documentary. Neither Agee nor Gates was drafted into the NBA. Nonetheless, both young men were able to turn the film's success and their subsequent fame into a better life for themselves and their families. They took the money generated from the film and bought better housing. Additionally Arthur Agee, the younger of the two basketball players, launched a foundation promoting higher education for inner-city youth and began the "Hoop Dreams" sportswear line in 2006. Gates is the senior pastor at Living Faith Community Center in Cabrini–Green, where he works at the Kids' Club. The families of both men have experienced losses since the release of the film. On Thanksgiving morning 1994, Agee's older half-brother, DeAntonio, was gunned down at Cabrini–Green. In September 2001, Gates' older brother, Curtis, 36, was shot to death in the Chicago Lawn neighborhood. Arthur's father, Bo Agee, was murdered in 2004. The actual story behind Hoop Dreams was not over even after the film was released. Cable TV channel TNT planned to make a remake of the story as a fictional movie for television. A book based on transcripts from all of the interviews conducted was also released in the spring of 1996. After the release of the film, William went on to play basketball at Marquette University, while Arthur went to play at Arkansas State. However, the National Collegiate Athletic Association (NCAA) advised the boys and their families they could not accept any money generated by the film without forfeiting their their amateur status, which would cause them to lose their university scholarships and would make them ineligible to participate in NCAA-sanctioned intercollegiate athletic activities. A sequel Hoop Reality (2007) explores what happened during the last decade from where Hoop Dreams left off. Patrick Beverley from Chicago's hardscrabble West Side appears as a struggling potential star also at John Marshall Metropolitan High School and is mentored by Agee and basketball coach Lamont Bryant. As a postscript to Hoop Reality, he was picked for the 2009 NBA draft and as of 2015 was with the Houston Rockets. In October and November 2009, a series of events were organized in Chicago to commemorate the 15th anniversary of Hoop Dreams. In December 2013, the Sundance Film Festival announced that Hoop Dreams would screen in the "From the Collection" program at the 2014 Sundance Film Festival, 20 years after the film made its world premiere at the 1994 Festival. Filmmakers Steve James, Peter Gilbert and Frederick Marx and subjects Arthur Agee and Sheila Agee attended for the premiere of a new digital restoration that was the collaborative effort of Sundance Institute, UCLA Film & Television Archive, the Academy Film Archive and Kartemquin Films. Hoop Dreams was shot primarily on analog Beta SP videotape, so the image was cropped and transferred for its commercial release. Working from multiple elements, including standard definition video masters and a 35mm film print, the project team created a new uncropped, high-definition digital master that better represents the pictorial quality of the original videography. Digitally remastered at Modern VideoFilm with sound restoration by Audio Mechanics, this version allows future audiences to see the film as conceived by its filmmakers. Nora Gully managed the restoration project for Kartemquin with archivist Carolyn Faber, working extensively with Ross Lipman, who oversaw the restoration for UCLA. The restoration then screened at the following 2014 festivals: Full Frame, BAFICI, Dokufest, BFI London Film Festival, Twin Cities Film Festival, Indie Memphis, and DOC NYC. Special celebratory screenings were also held in Los Angeles, Seattle and Chicago. The Criterion Collection announced that on March 31, 2015, the newly restored Hoop Dreams would be released on Blu-ray for the first time. ↑ "HOOP DREAMS (12)". British Board of Film Classification. March 28, 1995. Retrieved November 17, 2014. ↑ Dunks, Glenn (December 6, 2014). "Team FYC: Citizenfour for Editing". The Film Experience. 1 2 3 4 Harrington, Rob (2009-04-01). "Dreams don't cost a thing". Independent Weekly. Retrieved 2009-04-03. ↑ Guerrasio, Jason (January 15, 2014). "An oral history of Hoop Dreams, 20 years after its première". The Dissolve. Archived from the original on May 5, 2015. Retrieved January 2, 2015. 1 2 "Ebert's 10 Best Lists: 1967-present". Chicago Sun-Times. Retrieved 2 January 2014. 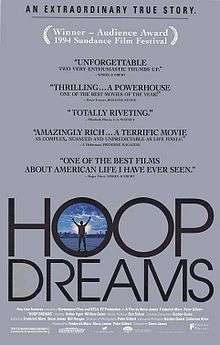 ↑ "Hoop Dreams Movie Review". October 21, 1994. Retrieved June 16, 2015. ↑ "The Best 1,000 Movies Ever Made". The New York Times. April 29, 2003. Retrieved May 21, 2010. ↑ "Hoop Dreams". Rottentomatoes.com. Retrieved 14 January 2012. ↑ Thomas White (December 2007). "IDA's Top 25 Documentaries". Documentary.org. Retrieved 9 January 2012. ↑ "The Great American Documentary". Chicago Sun Times. November 5, 2009. Retrieved November 29, 2010. ↑ ""Hoop Dreams" father slain". Chicagoist. Retrieved January 2, 2015. ↑ James, Caryn (7 October 1994). "Hoop Dreams: Dreaming the Dreams, Realizing the Realities.". The New York Times. Retrieved 2 January 2015. ↑ "Celebrate with us: Hoop Dreams 15th Anniversary!". Kartemquin.com. Retrieved January 2, 2015. ↑ Natasha Greeves (December 11, 2013). "2014 Sundance Film Fest Announces 20th Anniversary of New - Shadow and Act". Shadow and Act. Retrieved January 2, 2015. ↑ "Hoop Dreams". Kartemquin.com. Retrieved January 2, 2015. ↑ "Hoop Dreams". The Criterion Collection. Retrieved January 2, 2015.